Select from the list below to view the blog entry. 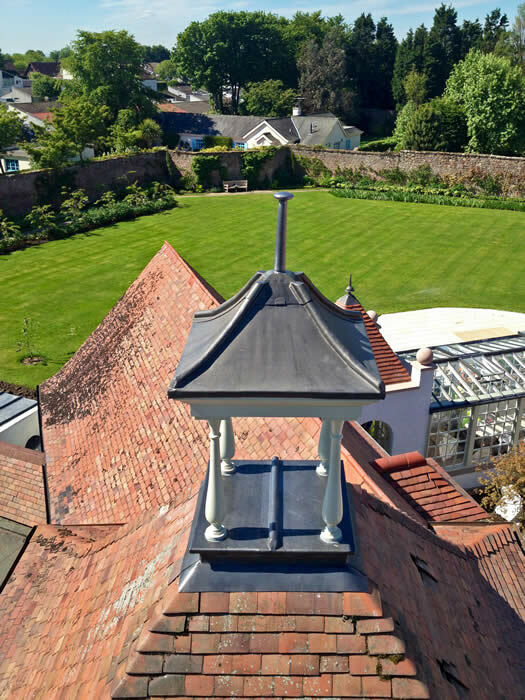 For Heritage Roofing we entered two projects and were delighted to win for Hermitage Gardens, Edinburgh, which was a complete roof refurbishment, using 2nd hand green peggie slates on a traditional detached property. 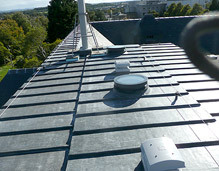 There was also significant leadwork to compliment the slating. On the chimney haffit we introduced a storm roll with designed flashing which enabled us not to cut a raggle into the stone. 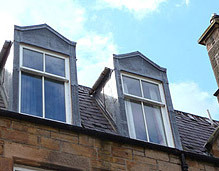 The design on the curved front dormer was created by our team. The judges said "The detail and volume of work across the Hermitage Gardens project stood out from the rest. The attention to detail is in a class of its own. It should be noted that the heritage section had a significant number of high calibre entries." For Fully Supported Metal we entered Raeburn House Hotel which was an iconic Victorian hotel in Stockbridge, Edinburgh, which had been vacant for many years. The existng B-listed building was to be reinstated as per the original detail, and a new extension added to compliment this. The leadwork covered some 400m2. 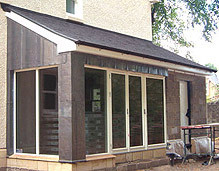 The equidistant wood rolls enhanced the complete look of the roof. 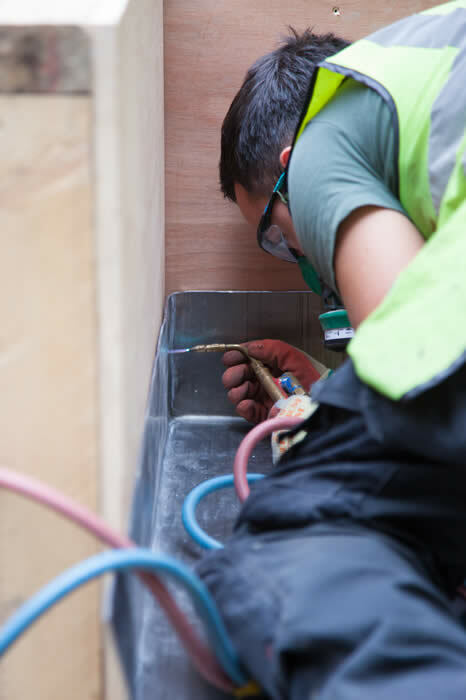 The hotel is fast becoming one of Edinburgh's premier venues. 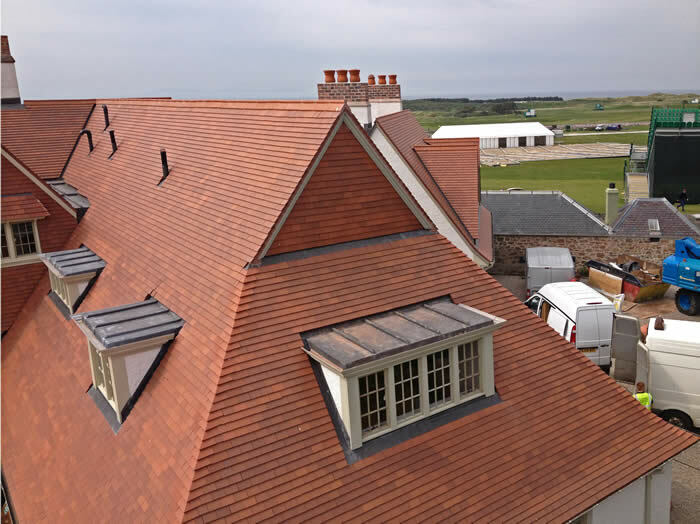 The judges said "Feature lead window pods, lead dormers and large areas of traditional lead roof work made this project stand out from the rest. First class attention to detail." Here is Steve getting presented with the award from Kaye Adams. 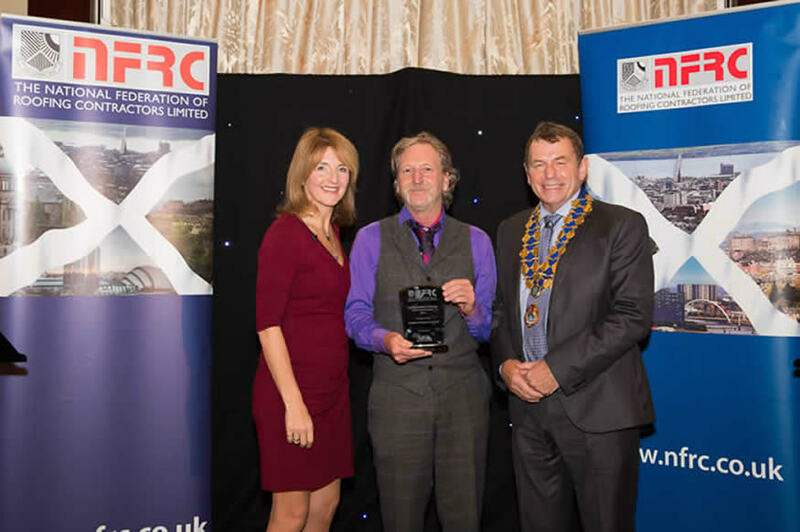 This year’s event was launched by Colin Tennant (Historic Scotland’s Head of Traditional Materials and Skills) who was very complimentary of the event and close working relationship Historic Scotland has with key stakeholders in the industry, including NFRC. 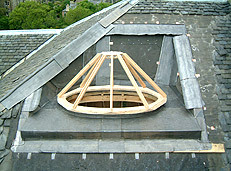 For the 2nd year running we gave a roofing demonstration on Lead Roofing on 12 August. 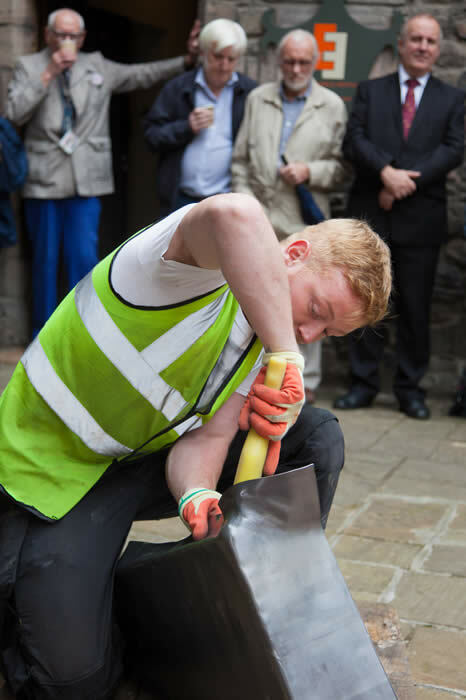 All the events at this years Traditional Building Festival were sold out and the feedback was extremely positive, so remember to book your place for 2015. For further information please contact us. The event in Falkirk was attended by Margaret McCulloch MSP, Michael Matheson MSP (Minister for Public Health) and Siobhan McMahon MSP. Michael Martin, our 2nd year apprentice is currently studying lead roofing at Forth Valley College in Falkirk and gave a demonstration of the skills he has learnt as part of his apprenticeship. 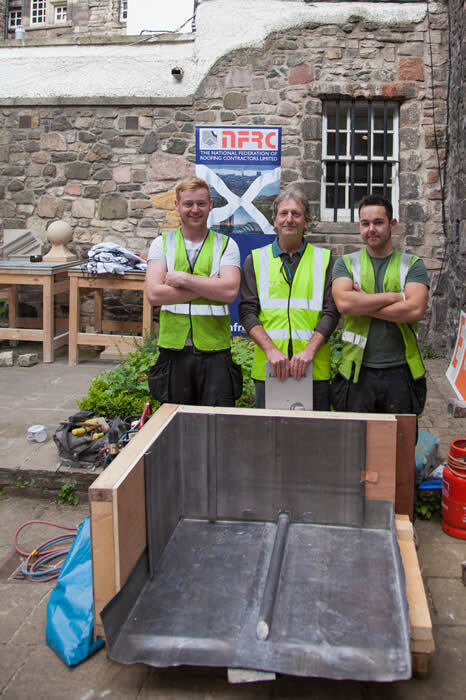 Master craftsman Gordon Finlayson was on hand to chat with potential future apprentices. 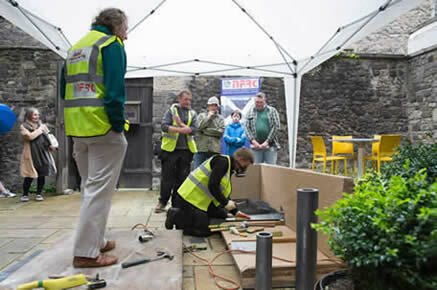 During this years Fringe, we presented a demonstration of lead working skills at the Edinburgh Traditional Building Festival. 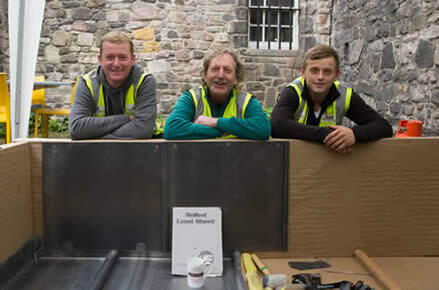 The festival celebrates Edinburghs traditional buildings and offers everyone an opportunity to learn about the skills and materials used to build and maintain them for future generations. 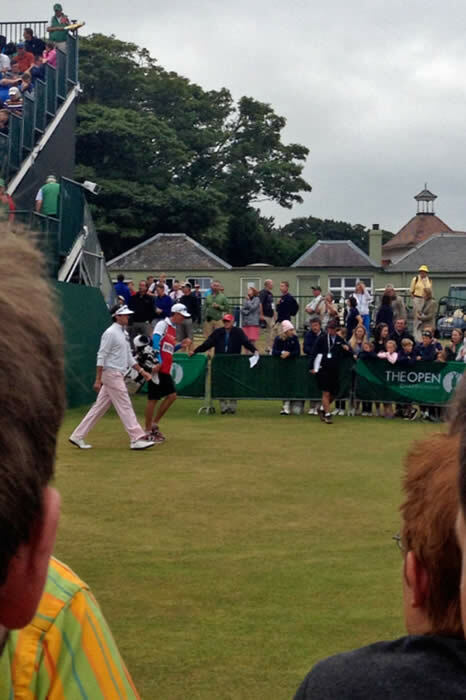 The Open Golf Championship was held at Muirfield links this year. Greyfriars worked on the Gatehouse which had to be completed in time for this prestigiuos event. It was a fabulous project to be involved in as several top golfers' famillies would take residence here during the competiton. See if you can spot a Major winner admiring our work.